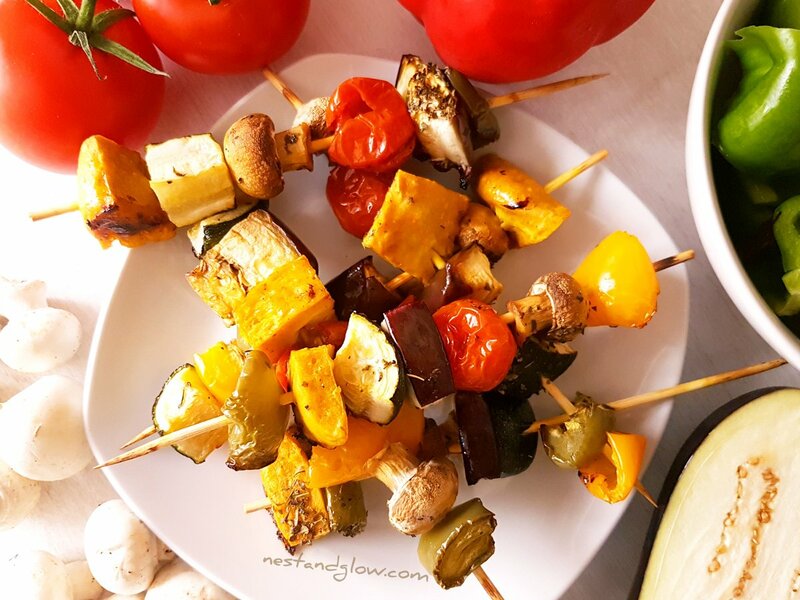 Easy to make kebabs with cubes of high protein chickpea tofu and Mediterranean vegetables. Don’t be put off by the idea of making your own chickpea tofu – it really is straightforward and foolproof. Suitable for vegan, gluten-free, soy-free and grain-free diets. 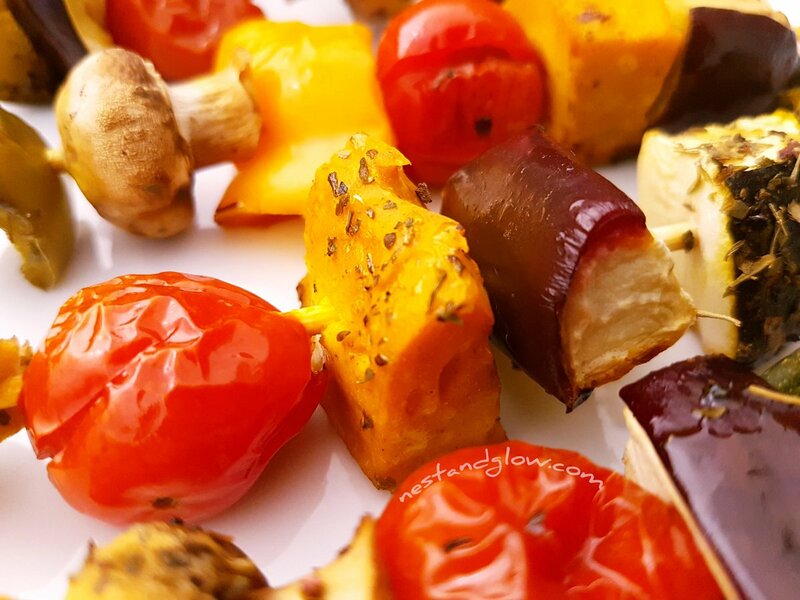 Forget using tofu or any replacement meats when it’s this easy and tasty to make your own. I don’t eat much soy and was so happy to discover that chickpea tofu is a nutritionally superior product and can be made quickly. This chickpea tofu is far cheaper and also has more nutrients, vitamins and fibre than soy tofu. It’s more or less the same great texture and flavour sponge as normal tofu. It isn’t quite as neutral as soy tofu as it has a slight chickpea taste. Mix together the chickpea flour, turmeric and smoked paprika with half of the water into a paste. Bring the other half of the water to a simmer with a pinch of salt. Stir in the chickpea mixture into the water and stir constantly for 5 mins while simmering. Be careful not to let the bottom of the mixture catch. Remove from the heat when thick and pour into a glass dish. Chill for half an hour in the fridge then it should come away easily from the dish. 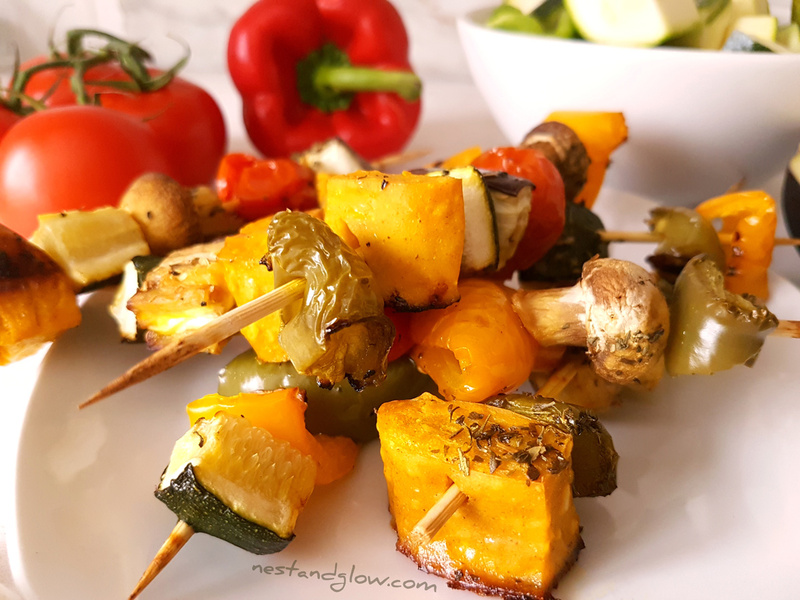 Cut into cubes and then thread onto the kebab sticks with bite-sized chunks of the other vegetables. Squeeze on lemon juice, sprinkle with thyme and brush with oil. You can store in the fridge for a day before cooking. Bake at 200C / 390F in an oven or grill on a BBQ. Enjoy once the chickpea tofu is golden and the vegetables are cooked. My tofu has a golden glow as it’s loaded with turmeric. I added double what the recipe lists as I do like to a decent hit of turmeric in my food. If you don’t like turmeric then feel free to leave it out as it’s just there for colour and nutrition. With double the amount I didn’t taste it in the final dish. As this chickpea tofu is grilled it gets a golden delicious crispy texture. You may want to sift and whisk your chickpea flour as you may notice mine had a few lumps in the video. It still turned out great even with these tiny lumps. The oil is optional in this but it does help even cooking. I don’t often use oil for cooking but when I do then I choose an oil with a high smoke point as it will be heat stable. For these I brushed with a small amount of cold-pressed rapeseed oil. If I wasn’t photographing then I would have omitted the oil and they will be just as tasty. You may notice I forgot the red onion in this! In fairness, they were so delicious that I didn’t realise until I was photographing another recipe and cut an onion lengthways as a prop. Maybe this was me subconsciously testing the recipe for those on an onion-free diet! 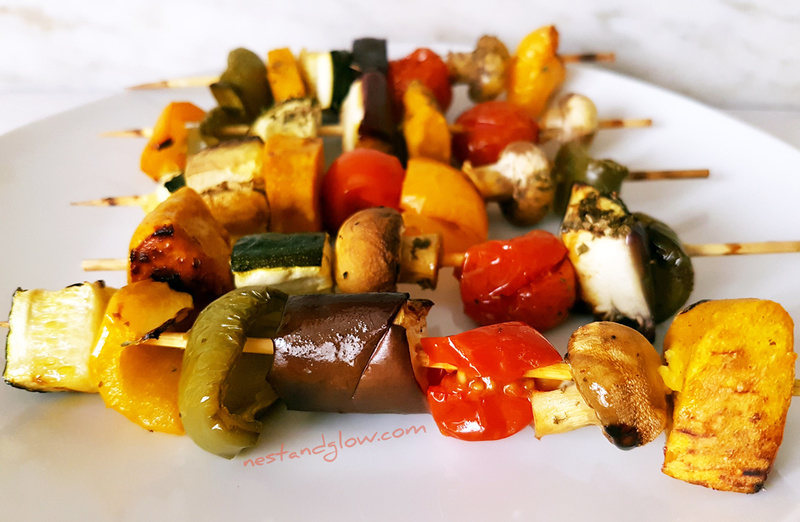 I used bamboo skewers for these and did soak them quickly for 10 mins but metal ones will work just as well. Chickpea flour is often called gram flour and is a common ingredient in many Asian cuisines. It’s found in Asian supermarkets where it’s considerably cheaper than health food shops. At the time of writing a 1kg bag can be purchased for £1.49 in the UK. 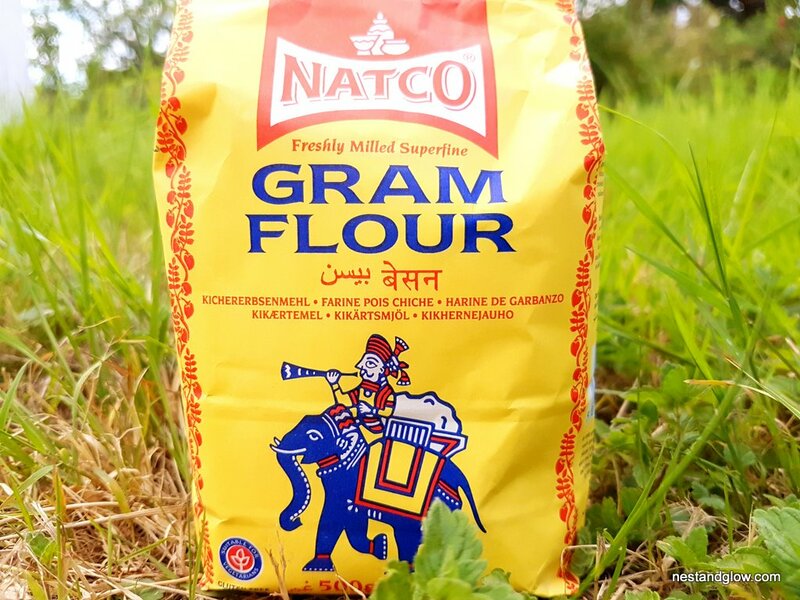 Gram flour is useful as an egg replacement in healthy vegan cooking. It’s high in carbohydrates and protein while also being gluten-free. Onion bhajis are made using chick pea flour.